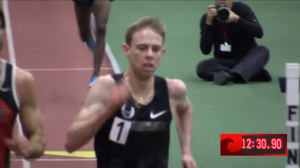 Galen Rupp has shattered Lopez Lomong‘s American indoor 5,000 record tonight at Boston University. Rupp took the lead with a mile to go and ran 13:01.26 to break Lomong’s 13:07.00 American record. Rupp’s former college rival Sam Chelanga was second in a new personal best of 13:04.35 (previous PR of 13:09.67). Rupp’s Nike Oregon Project teammate Cam Levins, who led the race for roughly 800 after the rabbit stopped at 2,600 meters, ended up third in a new Canadian record of 13:19.16, shattering Jason Bunston‘s Canadian record of 13:25.87 from 1997. We’ll have more later, but Rupp went roughly 4:14-4:12-4:04-30.36 for the first three 1,600s and the last 200-meter lap. 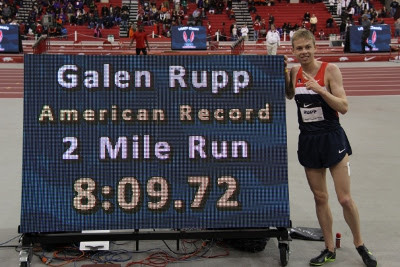 Galen Rupp one lap from glory. The race before the 5,000 was an American record attempt in the women’s 1,000. However, Nike Oregon Project team members Mary Cain and Treniere Moser ended up nowhere near Jen Toomey‘s American record of 2:34.19. Mary Cain did end up with a new junior indoor world record of 2:39.25 (outdoor record is 2:35.4).